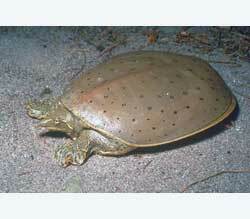 Habitat: The Florida softshell is likely to be found in large sinkhole ponds, large lakes (such as Okeechobee), and large karst springs and their slow-flowing, vegetation-choked river channels. Occasionally they will move overland and visit seasonal ponds. The hatchling Florida softshell turtle is an attractive species and a beautiful addition to a home aquarium. They are strong swimmers and thus do well in deeper water habitats. However, Florida Softshells reach large body sizes and become quite pugnacious as adults, thus the eventual disposition of the animal may need to be considered at the outset. Florida softshells will occasionally bask, but usually while floating on aquatic vegetation or partially submerged. Basking sites should not contain abrasive materials, such as sandstone rocks or concrete as these will irritate the softshell’s plastron. Because Florida softshells may be quite aggressive, they often show signs of injuries when kept together with other softshells, and occasionally other hard-shelled turtles. Thus, softshells are best kept separately. Florida softshells are carnivorous and will capture small minnows and other fish, such as mosquitofish (Gambusia sp.) in aquarium settings. They will also eat turtle pellets, although they are more stimulated to feed when presented with live food. Clean, filtrated water is a must for keeping Florida softshells healthy.